Dr Mohd Zulkarnain Sinor, Deputy Dean, Faculty of Dentistry, University Sains Islam Malaysia(USIM), Malaysia. Mr. Hove. Kudakwashe, National University of Science and Technology, Zimbabwe. Dr. B. M. Otta, Head, Department of Population Studies, F. M. University, Balasore- 756 019 Orissa, India. Dr. Hui-Fang Shang, Professor, I-Shou University, Taiwan. Dr. Ozge Ozgur, Assistant Professor, Adiyaman University, Turkey. Dr. Zian Sue, Professor, Department of Geology, Daegu National University of Education, South Korea. Dr. Sara Maioli, Department of Business Administration, Newcastle University, UK. Phil Marfleet, PhD, Professor, School of Humanities and Social Sciences, University of East London, UK. Dr. Linda Botterill, Professor in Australian Public Policy, University of Canberra, Australia. Mohamad Termizi Borhan, Ph.D Fellow, UNESCO Chair in Problem-Based Learning, Aalborg University, Denmark. Dr. Morteza Jamali Paghaleh, Professor, Islamic Azad University, Zahedan Branch, Iran. Dr. Mucahit Celik, Assist. Professor, Adiyaman University, Turkey. Dr. Neelke Doorn, Assistant Professor, Delft University of Technology, The Netherlands. Dr. Mohammad Naqib Ishan Jan, Associate Professor, Ahmad Ibrahim Kulliyyah (Faculty) of Law, International Islamic University Malaysia. Dr. Imo Jackson Ekpoh, Associate Professor, University of Calabar, Calabar, Nigeria. Dr. Raphael Snir, Senior lecturer, The Academic College of Tel-Aviv Yaffo, Israel. Dr. Christa Ellen Washington, Assistant Professor, Saint Augustine's College, United States of America. Dr. Darron Thomas, Lecturer, University of Technology Jamaica (UTech), 237 Old Hope Road, Kingston 6, Jamaica WI. Dr. Lianju Sun, Qufu Normal University, P.R. China. Khaleda Yasmin, Director of Centre for Promoting Ideas (CPI), Bangladesh. 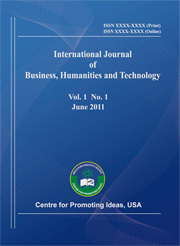 Executive Editor, International Journal of Business, Humanities and Technology. Dr. Normah binti Othman, SMP, Centre for Modern Languages and Human Sciences, Universiti Malaysia PAHANG, Malaysia. Ruchita Verma, Senior Research Fellow, Commerce and Business Management Department, Guru Nanak Dev University, Amritsar, Punajb, India. Dr. Hsiao-wen Huang, Assistant professor, Department of Information Management, Chang Jung Christian University, Taiwan. Dr. Shamsi Bawaneh, Chairman of Business Department, Coordinator of Lancaster GLOBAL MBA , Coordinator at PSUT for one of TEMPUS Project-ASPIRE, Department of Business, King Talal School for Business, Jordan. Dr. Shamsi Bawaneh, Chairman of Business Department, Coordinator ofLancaster GLOBAL MBA , Coordinator at PSUT for one of TEMPUS Project-ASPIRE, Department of Business, King Talal School for Business, Jordan.